Alex Lyon, who stopped all but one of the 95 shots he faced in an American Hockey League playoff game that ended early Thursday morning, was honored as Minnesota's best high school goalie a few years ago. There are plenty of heroes in a five-overtime hockey game, but it’s safe to say the winning goalie and the game-winning goal scorer are a the top of the list. 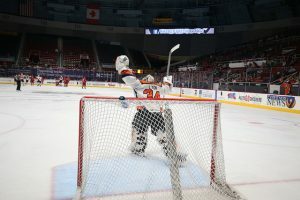 In the case of Lehigh Valley’s 2-1, 5OT win over Charlotte in Game 4 of their American Hockey League series late Wednesday/early Thursday, goalie Alex Lyon vaults to the top of the list. Lyon, who played Minnesota high school hockey at Lake of the Woods — 300 miles north of the Twin Cities, right on the Canadian border — made a whopping 94 saves on 95 shots in securing the victory in a game that lasted more than 6 hours of actual time and ended after 1 a.m. Eastern in Charlotte. It was the longest game in the 82 year history of the AHL. While Lyon’s totals are staggering, though, they are no fluke. Lyon was the Frank Brimsek winner as the top high school goalie in the state in 2011 and was a three-year standout at Yale. He made his pro debut in 2016-17 with Lehigh Valley, affiliated with the Flyers, and made his NHL debut this past season when he appeared in 11 games (seven starts) and posted a 4-2-1 record and 2.75 GAA. That moment wouldn’t have been possible, though, if not for Lyon — who made 79 consecutive saves after allowing the tying goal way back in the second period. Alex Lyon, take a bow. And get some rest. Game 5 — Lehigh Valley leads 3-1 in the series — is Saturday.